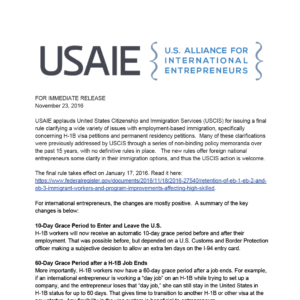 USAIE applauds United States Citizenship and Immigration Services (USCIS) for issuing a final rule clarifying a wide variety of issues with employment-based immigration, specifically concerning H-1B visa petitions and permanent residency petitions. Many of these clarifications were previously addressed by USCIS through a series of non-binding policy memoranda over the past 15 years, with no definitive rules in place. The new rules offer foreign national entrepreneurs some clarity in their immigration options, and thus the USCIS action is welcome. For international entrepreneurs, the changes are mostly positive. We have summarized the Final Rule in this PDF. Feel free to share with interested parties and contact us with any questions. This entry was posted in Employment Issues, News and tagged EAD, H-1B Visas, I-140, Immigration Law, USCIS. Bookmark the permalink.